An amazing way to explore London, take this fun tour of some of the city’s beautiful parks and palaces. Led by an expert guide, jump on a bicycle starting off at Waterloo and set off into London, guided carefully and safely along the way. Cover some of the city’s most beautiful and iconic sights, including The London Eye, the Houses of Parliament, as well as the stunning palaces and parks in central London. Making stops along the way to talk about London’s history and the Royal Family, travel along London’s streets, cycle paths and parks. Cycle past Big Ben and Westminster Abbey in Parliament Square before heading on to see St James’s Palace. See the Queen’s official residence, Buckingham Palace, and watch the Changing of the Guard (if it is taking place on the day of your tour). With plenty of photo opportunities along the way, see Hyde Park, Kensington Palace and the Princess Diana Memorial. Take a look at some Royal haunts and cycle through the peaceful expanse of Horseguards Parade before returning to Waterloo. 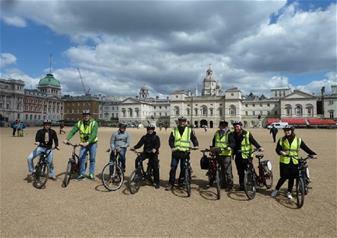 This is an informative and fun tour, ideal for those who love the freedom and exhilaration that cycling gives you. If you don’t fancy breaking a sweat, upgrade to an electric bike for a small fee of £10. Easy to control and super fun to ride, the electric bicycle has a small motor which helps you along the way and takes the difficulty out of steep hills! Cycle through the most beautiful locations in London at ease on a smooth electric bike. Using a small motor to take away the struggle of riding on any difficult terrain, it ensures you conserve energy and have a comfortable and relaxing adventure. An electric bike is a delightful way to take in the spectacular sights of London without putting pressure on the rider!